Getting ready for Christmas is a great, yet complicated job and there are many things to think about. From the tree stand for your brand new pre-lit Christmas tree, to the decorations around the house, Christmas is always a joy and a burden for many. If you already set up a theme for this year’s Christmas, things shouldn’t go but smoothly. Some go with the same theme outdoor and indoor so there are no surprises for the guests when entering your home. An important step in decorating your home is the Christmas wreath. 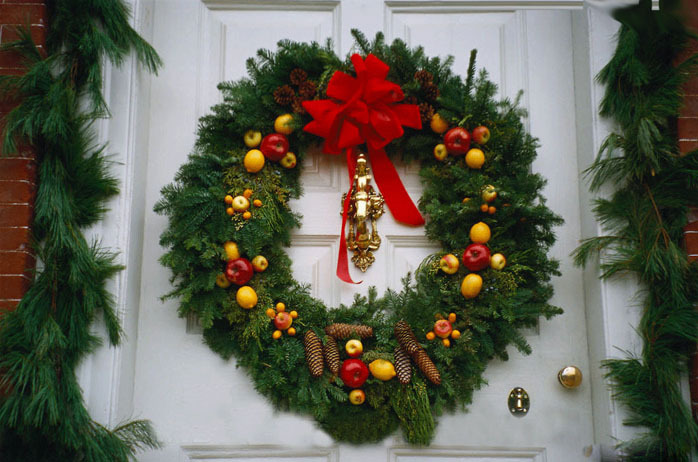 When placed on the front door, the Christmas wreath may prepare your guests for what’s inside. On the other hand, the Christmas Wreath may very be the “hint”, the transition from the outdoor theme to the one inside your home. This is a bold choice and requires a thought or two, but makes your winter holidays a lot more interesting. For the front door, you should go with a weatherproof Christmas wreath that takes some rain and cold temperatures. When you’re using the wreath only inside your house, it’s more important to choose the right place for it. You still want it to be the main piece of a specific area, after all. Whether you go with a simple, pre-lit Christmas wreath that lets you decorate it a bit more according to your taste, or with a Christmas wreath that is already adorned and prepared for the jolly season, the ball is totally in your court. The wreath is made with rattan and plastic, which makes it look so real and natural. It’s a combination of holly, pinecones and evergreens. The sparkling yellow lights add a festive note, whereas the angel placed in the center completes the appearance. Additionally, the clear angel is glowing as it features color-changing LED lights. The pinecones, the red berries and the snow-tipped greenery look very Christmasy, decorating the top and bottom of the wreath. The wreath comes with its hanging hardware. You need three AAA batteries to run the light. The battery box is very well hold in place with a strong Velcro strap. Well-made and nice looking, the wreath is a nice surprise, considering its price. Add a touch of blue-white Christmas in a window with the Lighted Christmas Glitter Snowflake Wreath. The wreath is made with hundreds of sparkly white snowflakes that look real and have a whimsical feel. They come with blue LED lights that give them a nice, magical sparkle at night. The wreath is made with plastic and rattan and handles the use for a good amount of time. You may hang it easily as it has a hook on the back. The lights are battery operated and you need three AA batteries for them. 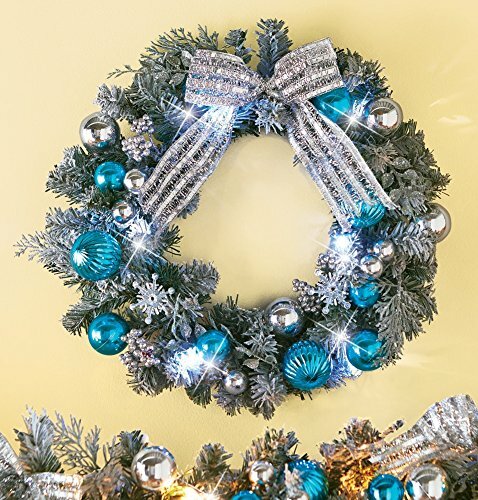 Sparkly and cute, the wreath is a touch of blue-white Christmas wherever you’d hang it. 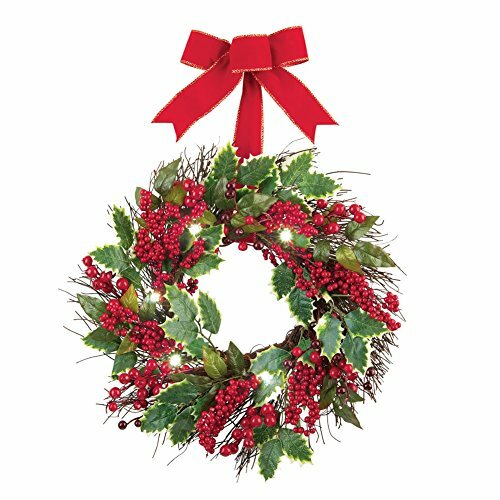 The 18” wreath is cute and has holly leaves and festive red berries that look so nice on the twig wreath. The lights give it a bit of sparkle and festive glow, whereas the bright red bow with golden trim helps it hand so nicely. The wreath is pretty well made, especially considering its price. It’s made with plastic, polyester, vine, and takes the use. You may need three AAA batteries to run the lights. Small, pretty and able to change any décor, the Christmas wreath is a good choice for the fixed budget. Pretty and festive, the Lighted Nativity Scene Christmas Wreath is a nice decoration to use when you’re going for the religious theme. 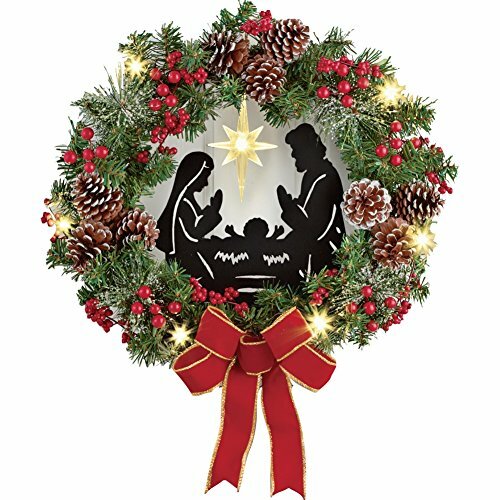 The holiday wreath represents the nativity scene of Joseph, Mary and Baby Jesus- as Christmas is in fact all about. The three of them are surrounded by bright red berries and pine boughs, whereas the snow-tipped pinecones leave the wintery feeling. A bright red bow gives a festive feel and the Star of Bethlehem gives a nice glow to the nativity scene. The wreath is made with polyfoam, plastic, pinecone, and need three AAA batteries for the lights. Pretty, festive and warm, the wreath is a nice choice to use this year. The Bucilla Felt Applique Wreath Kit, 15-Inch Round, 86264 Cookies & Candy is truly the choice for the DIY projects passionate that not only have the skills, but also the time to make their own wreath from beginning to end. The kit includes detailed designs and embellishments that look so nice and pretty. You get instructions that are fairly easy to follow and all the things you need to make your very own Christmas wreath. Note to self: the instructions are in three languages. 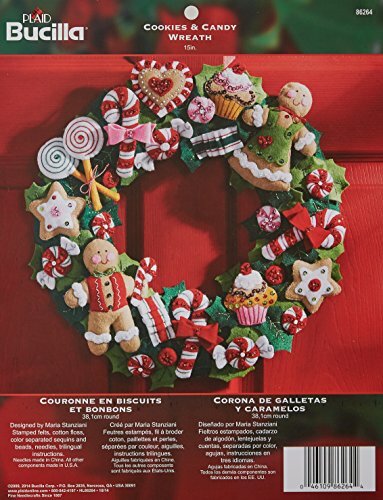 The Cookies and Candy wreath kit has a merry theme that is going to bring a jolly feel to any Christmas décor. You get stamped felt, beads, needles and embroidery floss as well. 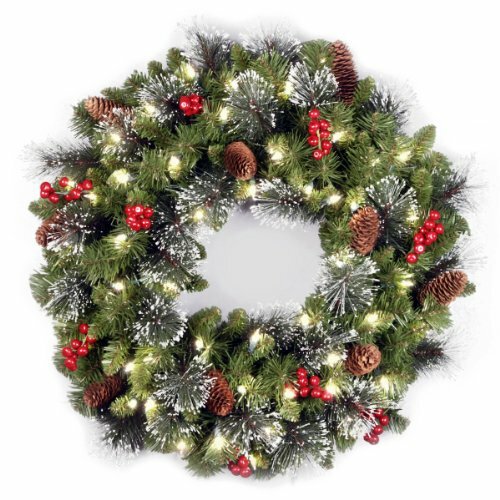 Made in our USA, the wreath is a nice, time-consuming, option for the DIY projects fans. 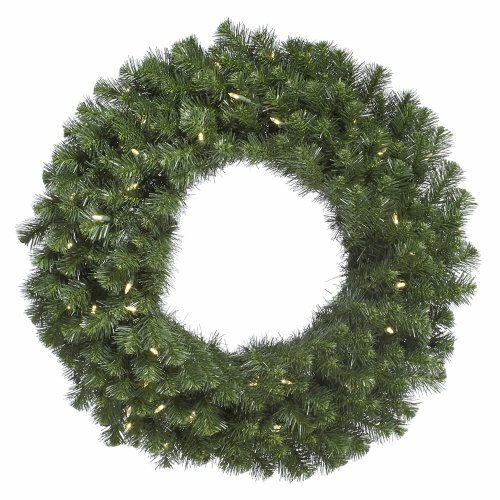 For those of you who go for the personalized decorations and the craft projects, the 30″ Traditional Green Canadian Pine Artificial Christmas Wreath – Unlit may be the perfect choice this year. The Canadian pine wreath is thick and full, having a real feel, even though it’s artificial. It’s unlit and has 300 tips, colored in two-tones of green, for a more real feel. You don’t need to put the wreath together in any way; you simply decorate it the way you want. The wreath is very well made and has a sturdy build, taking some handling when decorating it. The heavy-duty ring is made with a metal frame so you may easily and safely hang it. 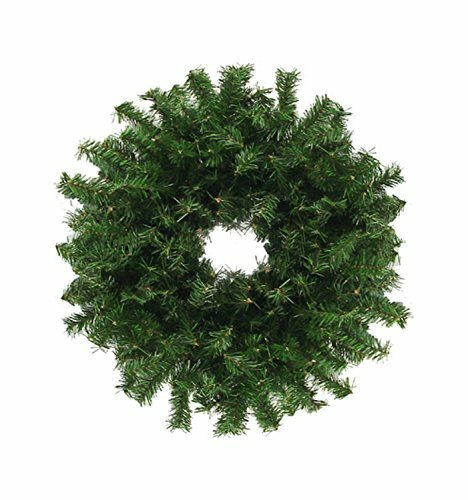 As it’s flame retardant and high quality, the wreath takes both the indoor and outdoor use. It’s made with PVC and metal and it’s uniform in its shape and size. Therefore, if you think you’re up for the task of decorating it, the wreath is an amazing choice. The tinsel wreath is all decorated and ready to hang out of the box. 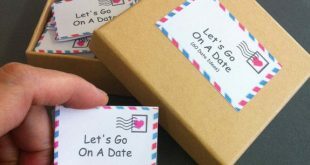 It comes very well packaged so you don’t have to worry about it. The wreath is nicely decorated with snowflake ornaments, crimson and emerald ornaments. The gold snowflakes add even more sparkle and the wreath really has “sparkly Christmas” written all over it. It’s very easy to use the wreath as it’s lightweight, despite its full appearance. You may use it for your doorway or hearth. Its crimson and emerald colors look nice and merry and fit any traditionally themed Christmas décor. The wreath is well made and shatterproof. When you want to add a bit of color to your indoor décor, don’t hesitate to give it a go with the National Tree 24 Inch Crestwood Spruce Christmas Wreath with Silver Bristle, Cones, Red Berries and 50 Clear Lights (CW7-306-24W-1). The wreath has a trimmed look and features brightly colored red berries, pinecones and some silver glitter to add a touch of festive feel. It’s pre-lit with 50 clear lights that give a warm, white light. You need to plug it in an electrical outlet, though. You may use the wreath on your door, on some wall inside the house or simply by the window. 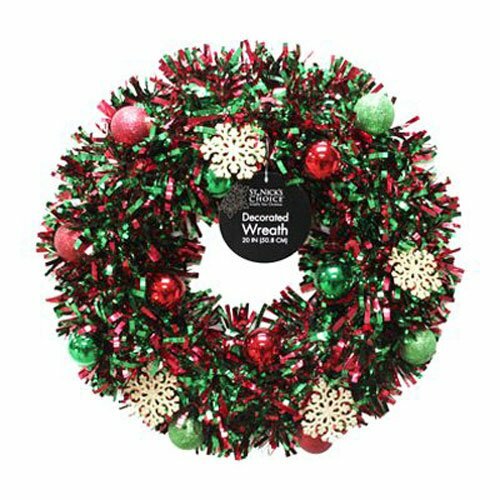 No need to worry about your safety as the wreath is fire-resistant and non-allergenic. 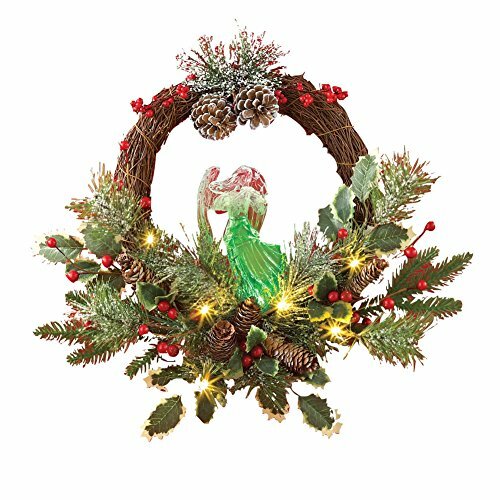 For those of you who don’t want to decorate anymore the Christmas wreath, a great and elegant choice would be the Brylanehome Cordless Battery-Operated Led 30″ Christmas Pine Wreath (Green,0). The wreath comes beautifully decorated and you simply need to hang it, for a full impact. It features pine cones, golden globes, bright red berries and some real-looking red apples. The glittery ornaments make it look very festive and the big red bow with golden accents completes the looks. Let’s not forget the LED lights that run on AA batteries. The time setter for the lights works well, giving you the chance to light the wreath up only when you’re at home. Festive and elegant, the wreath is an option that doesn’t disappoint. The real feel of the National Tree 24 Inch Wintry Pine Wreath with Cones, Red Berries, Snowflakes and 50 Battery Operated White LED Lights (WP1-300L-24W-B1) is one of its best assets, but the wreath may satisfy many needs and likings for various reasons. The wreath is trimmed with pine cones, red berried and snowflakes and looks festive and elegant, without overdoing it. It’s pre-lit with 50 UL listed LED lights that are pre-strung. They are low voltage so no worries on your safety either. The white lights give a nice, warm light so this needs to be considered if you’re going for a brighter Christmas wreath. The wreath comes with on/off button and it turns on automatically when the evening comes and off in the morning. Full and thick, the wreath may be used as it is, but you may definitely add one or two more ornaments if you’d like. Festive and colorful, the National Tree 30 Inch Kaleidoscope Wreath with 70 Battery Operated Soft White LED Lights (KS13-300L-30WB) may become a merry and sparkly center piece of any Christmas décor. The wreath has a 30” diameter and is pre-lit with 70UL listed LED lights. The lights give a warm, white light and the LEDs are energy-efficient and long lasting. 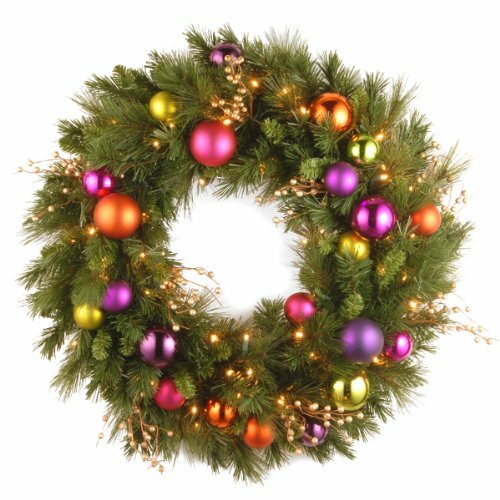 The ornaments are colorful and the wreath features pink, purple and orange tones that are all metalized and festive looking. The gold berries add more glitter and combine so nicely with the ball ornaments. Full and thick, the wreath is well made and doesn’t shred, taking the handling for quite some time. Leaving a vintage feel, the Thomas Kinkade Victorian Christmas Village Wreath by The Hamilton Collection is a wreath that has a whimsical and beautiful glow, creating an everlasting, old-fashioned Christmas décor. The wreath is based upon the holiday paintings of Thomas Kinkade and each one is special and unique. 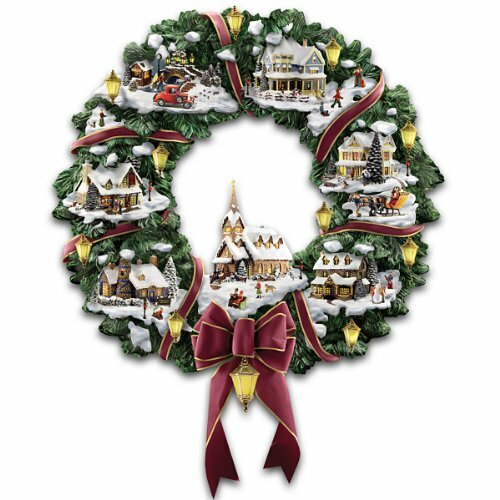 Carefully handcrafted and hand-painted, the wreath recreates the Victorian charm of Thomas Kinkade’s arts. Some children build a snowman; villagers relax a horse-drawn sleigh ride, whereas some carolers sing. Who wouldn’t want to have all of these details around their home for Christmas? The windows of 7 lighted buildings combine amazing with the lanterns and the wreath is a fairy tale choice. The wreath comes with a hanging device so you may use it right out of the box. Hand-numbered and presenting a Certificate of Authenticity, the wreath is a sophisticated, elegant and whimsical option that puts some magic into your Christmas décor forever. Made with 1100PVC tips, the Vickerman Unlit Big Mountain Pine Artificial Garland with Artificial Pine Cones, 6′ x 17″is the ultimate wreath that is so full that only needs a red bow as a final touch. 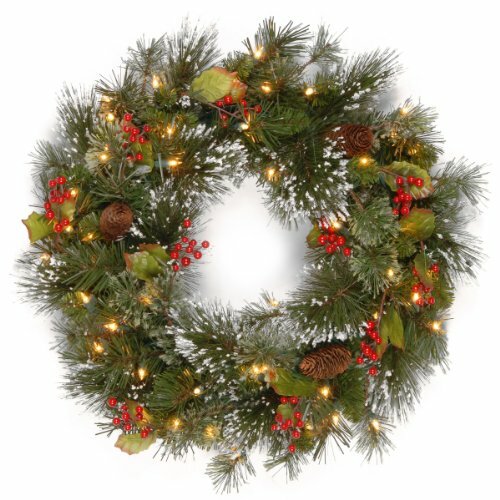 The 72” pre-lit Cheyenne Pine Christmas wreath is very nicely made with a beautiful mix of foliage. The 3in wide needle pine tips are long and have two-tone green color. They mix very naturally with shorter (1.5in wide) light green tips, creating a full and real feel look for the wreath. The baby pinecones match the looks of the wreath and have a real feel as well. The wreath comes in 4 pieces but it’s easy to put together. It comes with the hardware you need for installation and its tough ring metal frame backing is sturdy. The wreath is lightweight and well made, taking the decorating very well. Made with PVC, metal and pinecones, the wreath impresses the eye and has a luxurious feel to it. 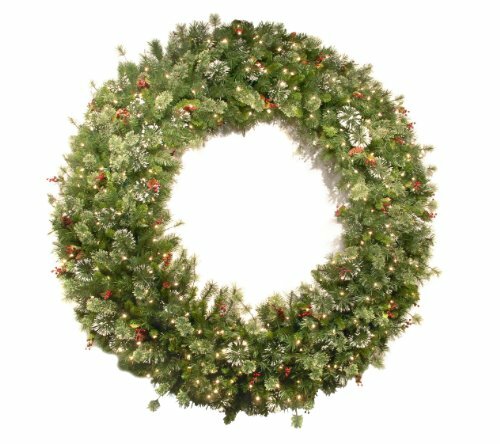 Elegant and looking real, the Vickerman Cashmere Pine Green Wreath with 200 Warm White Italian LED, 60-Inch is one great investment to make for your Christmas décor. 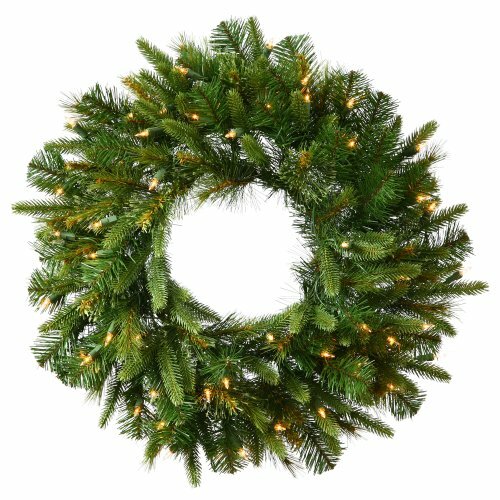 The wreath has 576 PE/PVC tips that look so real and you almost feel the real smell of the pine when hanging the wreaths. The lush foliage gives the wreath and high quality appearance and natural feel. The wreath includes 200LED Italian lights that give a warm, white light. The construction of the wreath is impressive and the metal ring build makes the wreath long lasting and able to take the intense handling. You may add as many ornaments as you’d like as the sturdy build of the wreath enables to take the weight of the ornaments. Elegant and realistic, the wreath is worth every single penny. The 72” diameter of the National Tree 72 Inch Wintry Pine Wreath with Cones, Red Berries, Snowflakes and 400 Clear Lights (WP1-300-72W) recommends it as a great option if you’re looking for an impressive Christmas wreath. The wreaths comes with 400 UL listed clear lights that give a nice, warm light. It’s pre-strung, so you don’t need to worry about installing any lights. 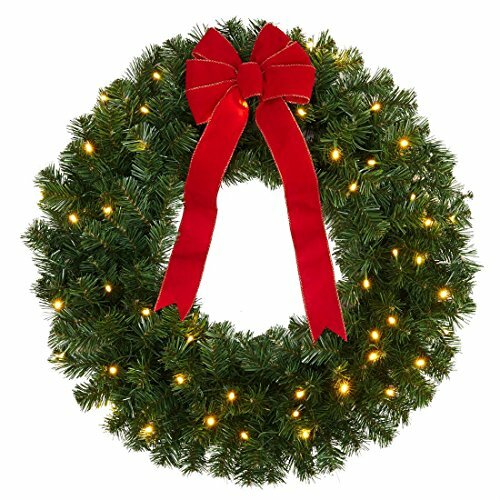 The wreath is non-allergic and flame-resistant, so you may use it both indoor and outdoor. Very well made and with a bulb lock that keeps the bulbs from falling out, the wreath is a good investment any year. It comes with spare bulbs and fuses and everything about it is high quality.